We’d love your help. Let us know what’s wrong with this preview of About Time 7 by Tat Wood. To ask other readers questions about About Time 7, please sign up. * How brilliant must (the admittedly brilliant) Tat Wood think himself if he needs to provide dozens of witty references that require a footnote for the reader to understand? * For a book devoted to a TV series with such admirable educational aims (at least for the first half of its life), is it churlish to chortle at the moments where the author's verbosity approaches silliness, such as the line - written, it seems, in all seriousness - "since 2005, phylogeny has recapitulated ontogeny"? * The author is incredibly vociferous (if right) about his hatred for Ricky Gervais, but his repeated intolerance for the film "Marie Antoinette" certainly explains a great deal about his approach to "Doctor Who", don't it? * Has the word "supine" been used more often in any single book other than this? All of which is a preface to saying that this series is one of my favourite non-fiction works, and I'm so glad to have the lovably pompous (but not in a Lawrence Miles kinda way) Tat Wood back again for the first of at least three volumes covering the New Era of "Doctor Who". 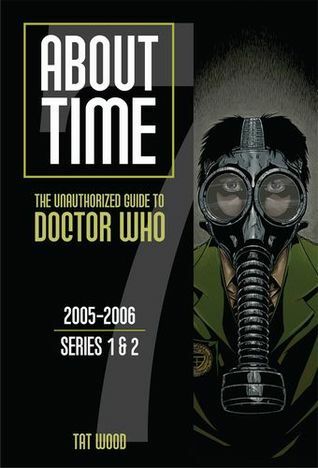 The first six volumes of "About Time" covered all of the series from 1963 to 1999, examining in painstaking detail the continuity, flaws, stylistic nuances, political and social origins, and influences of every single episode. The facts co-exist with brilliant and/or scathing reviews, and the true reverence of lifelong fans. Wood who co-wrote the majority of the series with Lawrence Miles but took carriage single-handedly after the notoriously moody Miles cut ties after five volumes. Those works were so important to me because of how much I discovered about the '60s, '70s, and '80s (before my time, you know). An original viewer, watching the series from a British middle-class family at 6PM on a Saturday night in 1973 undoubtedly took home countless references and implications unknown to me, recognised actors from their lifelong careers on the stage and screen of that island nation, and witnessed that single episode as part of a much larger narrative formed by what was on TV that night, that week, and that year. Placing the episodes of this 50-year-old series in that context is a smashing feat. Now that we're examining episodes I watched within a year of broadcast, it's intriguing to see how much I still missed, but also to get a greater sense of the behind-the-scenes aspect of the series. If you liked the first six volumes, you'll enjoy "About Time 7" a great deal. It does all that you asked, and more. We have a lot more accessible information about the making of these episodes, with Wood and contributor Dorothy Ail dig into, although at the same time we have neither the distance from them to allow for truthful (near-hostile) DVD extras like you can expect from Janet Fielding or Lalla Ward, nor enough space to really see how the series has evolved from this. Still, Wood makes the most of it and this quickly became one of my favourite volumes. When you combine "Torchwood", "The Sarah Jane Adventures", and the timey-wimey nature of the Tenth and Eleventh doctors, there's plenty of meat for the essays which accompany every story. (Here, the essays include: "Gay Agenda? What Gay Agenda? ", "Does Being Made in Wales Matter? ", "Are We Touring Theme-Park History? ", "Stunt Casting: What Are the Dos and Don'ts? ", and the all-important "How Long is Harriet in No. 10?" Of course, trying to provide a guide-book for a show like this is tough when you're an uber-fan, and Wood and Miles' own opinions came through resoundingly clear in Volumes 4 - 6. Here, thankfully, that's pulled back a bit. Don't get me wrong, I want to know honest critiques, and to get inside the mind of fandom, but I also want each episode to stand on its own merits. It's clear that Wood has issues with the Davies era (and I share many of them) concerned about the showrunner's "Fear of a Zog Planet", about stunt-casting and repetitiveness, about the need for the extra-canonical production line possibly overtaking continuity, logic, and high-quality output on the main programme, about the show's increasing use of near-magic, the music (natch) and, presumably, much else. Rather than just ranting (as was sometimes the case in Volume 6), Wood takes the approach of the intelligent biographer (for the most part): simply present the facts, and let the facts do the talking for you. About Time: The Unauthorized Guide to Doctor Who is a series of books devoted to dissecting Doctor Who. The series began in 2004 with the very first seasons of the Doctor Who series, and is a work in progress that will presumably continue for the duration of the show. Although the books are also mentioned from time to time, the About Time series concentrates most heavily on the televised series and movies. This review focuses on the seventh volume, Series 1 & 2, aired in 2005 and 2006. Tat Wo About Time: The Unauthorized Guide to Doctor Who is a series of books devoted to dissecting Doctor Who. The series began in 2004 with the very first seasons of the Doctor Who series, and is a work in progress that will presumably continue for the duration of the show. Although the books are also mentioned from time to time, the About Time series concentrates most heavily on the televised series and movies. This review focuses on the seventh volume, Series 1 & 2, aired in 2005 and 2006. Tat Wood has worked on the About Time series since its inception, formerly as a co-author but currently as its sole author, although Dorothy Ail has made “contributions” as well. Wood has previously written for Doctor Who Magazine, and has been editor for fanzines Spectrox, Yak Butter Sandwich, and Spaceball Ricochet. A really interesting and thorough good to the first two series of the new Doctor Who. The book goes in depth through each episode, breaking it up into things like Firsts and Lasts, Critique, Production, and more, not skimping on any of them. Perhaps my favourite is the Things That Don't Make Sense section. But even more than the main bulk of the book I like the accompanying essays, which are very well written and about interesting topics, from funny ones like Is Arthur the Horse a Companion? (whi A really interesting and thorough good to the first two series of the new Doctor Who. The book goes in depth through each episode, breaking it up into things like Firsts and Lasts, Critique, Production, and more, not skimping on any of them. Perhaps my favourite is the Things That Don't Make Sense section. But even more than the main bulk of the book I like the accompanying essays, which are very well written and about interesting topics, from funny ones like Is Arthur the Horse a Companion? (which while funny is very well written) to Was Series Two Supposed to be like this? I feel like I learnt a lot from this book, and I also felt like it helped stimulate me into thinking about interesting aspects of the show myself, as most issues raised aren't definitively answered if there's no objective one - while the critiques are somewhat opinionated there's a generally fair and neutral tone throughout. I certainly don't agree with every opinion in this volume (and Tat Wood's vendetta against "The Impossible Planet"/"The Satan Pit" alternates between ridiculous & hilarious), but it's a book that is drug-like in its addictiveness. The entire "About Time" series is an amazing analytical achievement, and this volume was, perhaps, the most anticipated of them all. It was certainly worth the wait...and it was worth staying up half the night to devour it. One of the strangest things about "About Time 7" is that you get the feeling that whoever was writing the critiques of the episodes didn't actually like the show very much. The book is a wonderful resource on the lore and context of each episode of the 2005 revival of Doctor Who, but it often feels mean-spirited. Indispensable as ever, but they're not half as much fun to read since Lawrence Miles stopped. Tat Wood is co-writer (with Lawrence Miles) of the About Time episode guides to the television series Doctor Who. This book series, begun in 2004, emphasises the importance of understanding the series in the context of British politics, culture and science. Volume Six is entirely Wood's work. Wood has also written for Doctor Who Magazine. In a 1993 edition of "Dreamwatch", he wrote a piece entitled Tat Wood is co-writer (with Lawrence Miles) of the About Time episode guides to the television series Doctor Who. This book series, begun in 2004, emphasises the importance of understanding the series in the context of British politics, culture and science. Volume Six is entirely Wood's work. Wood has also written for Doctor Who Magazine. In a 1993 edition of "Dreamwatch", he wrote a piece entitled "Hai! Anxiety", in which the Jon Pertwee era of the series was — unusually for the time — held up to sustained criticism. In addition to this he has written features for various magazines, on subjects as diverse as Crop Circles, Art Fraud, the problems of adapting Children's novels for television and the Piltdown Hoax. He is also active in Doctor Who fandom, notably as editor of the fanzines Spectrox and Yak Butter Sandwich and Spaceball Ricochet, which mixes academic observations with irreverent humour and visual bricolage. Some of his fan writing was included in the anthology Licence Denied, published in 1997.